A few weeks ago, a local yoga studio owner posted a comment on social media that made me think. Until today, I haven’t had time to revisit the film she mentioned, Breath of the Gods, which is a documentary about Krishnamacharya and the origins of modern yoga. Here’s the comment: “One of the girls watching remarked how agile Iyengar was, even while practicing, while Pattabhi Jois could barely even walk with a cane. It was a keen observation, and, to me at least, speaks volumes about the two styles.” My apologies to you, Kelsey, for digging back through your Facebook to pull that quote. I am a total creeper. Guilty as charged. Breath of the Gods is a solid film that captures some of what made yoga into what it is today. It’s worth a watch. The comment comparing B.K.S. Iyengar to K. Pattabhi Jois isn’t incorrect. Iyengar is seen practicing asana with grace, while Jois walks with his signature walking stick. Why the difference? Are their practices really to blame? Any Ashtangi will get it, but maybe those outside of the Jois lineage won’t understand. I’d like to try and correct that. Here’s the thing: Jois stopped practicing asana after his son Ramesh committed suicide. I believe that was in the late 1970s or early 1980s, but I’m honestly not sure. I do know that Jois hadn’t practiced asana for a very long time when he died in 2009. It was a form of mourning. He still practiced the other seven limbs, though, and woke up long before dawn to practice pranayama and puja before teaching for hours each morning and afternoon. His teaching was a physical practice in and of itself. Legend has it that he literally carried Nancy Gilgoff through the series until she was strong enough to do it on her own. He dropped students of all sizes back and pulled them up from backbends every day. Jois remained such a master of pranayama that supposedly, when he went in for a check-up during his final years, he broke the machine that tests lung power. No matter how strong and able, Jois wasn’t going to appear as nimble as a man who continued to practice advanced asanas every day. I admire Iyengar’s commitment to the physical practice. It’s impressive. I see that kind of commitment in the senior western Ashtanga teachers. They’re now in their 60’s or older, and they all continue to practice asana. They look great. I don’t doubt that they’ll all live to a ripe old age and stay active up until the day they pass on to the next life. And let’s not forget Karen Cairns, who didn’t start the practice until she was 56, and is now an authorized teacher. Ashtanga seems to age well. Also, let’s not kid. Both men were old. Jois was 93, in the final year of his life, during the movie. He actually died before they completed filming. Yup. He was lucid enough to be in a movie in the months before he died. I think that’s pretty cool. Iyengar was 91 in 2009. No matter who was more flex, both of these men were doing something right. Heck, I’ll be thrilled if I have as much mobility as either of them in my 60’s, much less my 90’s. Mindfulness…meditation…again, more similarity than difference. I see two methods of accessing the quiet mind that asana helps us to achieve, two roads to the same destination. I’ve heard people complain that, unlike Iyengar classes, Ashtanga “doesn’t care” about alignment. If you end up in a class like that, walk out the door, and go find a teacher who’s authorized or certified, or has at least studied in Mysore or spent time with a certified teacher. 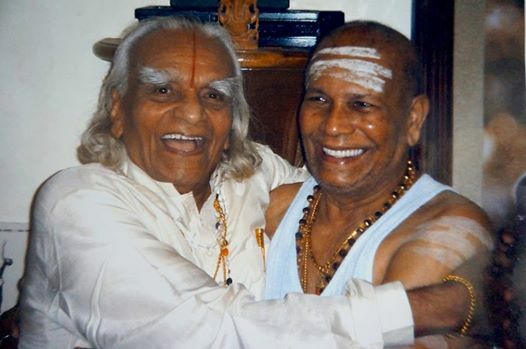 There’s no doubt that Mr. Iyengar was the king of alignment, and that lineage continues in his teachers. No one does alignment like an Iyengar. Ashtanga doesn’t discount alignment, though. Not at all. Ashtanga operates on a system that restores and cleans the lines of energy in the body. Alignment is important for that process. Also, all those hands-on adjustments that Ashtanga is famous for? Those are for the sake of alignment. My teacher doesn’t grab my thigh and externally rotate it during trikonasana for shits and giggles. She does it because it improves my alignment. The student who noticed the difference between the appearances of the two gurus of Western yoga during the movie was observant, but I can’t agree with the assessment that their physical appearance represents something fundamental about the practices they developed and spread throughout the world. Sorry, Kelsey. My intention here is not to call you out for something you said on social media weeks ago, but correct a misconception. “Never judge a book,” right? In any situation, there are multiple forces at work. In this situation, it was a major family tragedy, among other things. Besides, I’d rather find common ground between practitioners and styles than differences. I’m an Ashtangi, so of course I’m biased and think it’s the BEST EVERRR (enough so that I make myself look like a fool by writing a whole blog based on an offhand comment on social media) and believe it’s the ideal way to practice, but I try to remember that it’s not ideal or perfect for everyone. I have nothing but love for my brothers and sisters who practice Iyengar-style, or Jivamukti, or Hatha, or Yin, or whatever. I may not understand why Vinyasa practitioners spend so much time doing handstands, but I won’t pass judgment on the practice. Hell, I salute it. I can’t stand on my hands unless there’s a very sturdy wall very close behind me. Long story short, anyone who has a practice and devotion to it is worthy of respect. Period. This entry was posted in History and theory and tagged Ashtanga, iyengar, pattabhi jois by Emma. Bookmark the permalink. it was not legend, Nancy Gilgoff was my first real teacher and she told me herself he lifted her up, jumped her back and jumped her back through since her nervous system was so weak she couldn’t build the strength herself, but eventually did. Also, his dropping his physical practice was to take on the karma they believe Ramesh would incur from committing suicide, so he just strengthened the rest of his practices and as you mentioned was lifting, adjusting and moving students through the practice almost daily for the rest of his life, even up until two years before he left his body. Yes, Satinder, that’s exactly what I was talking about! I love how he taught Nancy. Thanks for expanding on the point about Ramesh, and thanks for reading! You are very correct about Iyengar teachers instructing different poses each class using precision and care to create a more mindful practice. Knowledge of Yoga in the West would be very limited if not for the supremely intensive effort of both Jois and Iyengar. You are correct in observing that a good touchstone to each style is to look at how practitioners “age” with the practice. The verdict: both styles are conducive for a long and joyous life! If I can even make it to 90, I’d be doing great. Off topic, is that cover photo taken in New Mexico? I grew up there and it looks very familiar. Thanks again for posting. Thanks for reading, Michael, and for commenting. You are right about that cover photo! It was taken in Rowe, NM. Tiny little place southeast of Santa Fe. Thanks for writing this post Emma, I have also had people make comments about Guruji and physical appearance as he aged, I always tell them know the book not the cover. Great reply as well Satinder!! Thanks for reading, Larry. I really appreciate it! thanks for your honest written experience of both lineage, I practice both styles and do find that there are more similarity than difference in a different ways. I think the way to go is finding things that they both agree upon..thanks again, namaste. We are all subject to aging and death… No matter what practice I do, I might die at any time…not connected with my asana practice. But I am confident that, most importantly, my sadhana will allow me to age and to die with grace and courage. How we live and die is our sadhana. Dying – young or old- is not a failure. Aging and its changes are not failures… Our practices of the eight limbs are a strong foundation to embrace these with grace and love! Beautiful words, Karen. Thanks for reading, and letting me use you as an example in my writing. On another topic, are you still in Blacksburg? I may be visiting the area in August and would love to practice with you if you are teaching. Thanks again for the comment! Still in Blacksburg- would love to practice with you! Great! I’ll bug you on Facebook if that trip ends up materializing. Thanks Emma the Post, just checked at Facebook now – so, I knew , that Joish stopped his personal practice, when his first son (??) died. So, if somebody know somethig about this fact (or fake?? ), let’s know it ! Hi cyberyogi. If you read the comment above by Satinder, it might shed some light on your question. Thanks so much for reading! Thank you for this article. As a devoted but not very experienced Ashtangi, I truly had some of my questions answered. I have also translated it into Russian for my fellow yogis, and someone has asked me whether anyone knows if Jois’s son Ramesh practised Ashtanga, too. I haven’t found any information at a glance, so I was wondering if you know the answer by any accident. Hi Julia! Thanks for reading and sharing. I appreciate it! I do not know whether Ramesh practiced Ashtanga or not. The whole thing is usually not discussed in the Ashtanga world because it’s such a sensitive issue. With much respect to all parties, it does not seem to make logical sense for Pattabhi Jois to put a halt on all asana self practice because of Ramesh? Is this something Pattabhi Jois stated himself or is this a supposition because of the timing? Of course there could be countless other reasons/factors not known but this idea itself doesn’t seem to hold water imho. Is there any corroborating source for this idea? Thank you. Tim Miller briefly mentions the topic in this article, which also appeared in Yoga Journal in 2003: http://www.ashtanga.com/html/article_miller_tim.html. Other early students of Jois have cited Ramesh’s death as the reason for Pattabhi Jois to stop practicing asana in conversation and on some social media, but not in such a public forum. It’s really a taboo topic. Out of respect, most Ashtangis don’t mention it, and I was probably out of line to write about it so publicly when I have no direct connection to the Jois lineage. Thanks for reading, and thanks for your question. Thanks so much for your reply Emma. On one hand, I can understand not mentioning or discussing the subject out of respect but on the other hand, in my opinion, it’s a question that clearly for some that would be even more glaring if unaddressed. It would I would guess (perhaps wrongly) be an ongoing unending contradiction to see a teacher advocating daily ardent practice when he/she is never doing a single asana much less practicing himself. At least for those to whom it is important, it provides some context and understanding and in this respect, again in my opinion serves to benefit ashtanga as a practice. I find it very helpful to know. Thank you for your writings (not just this one).